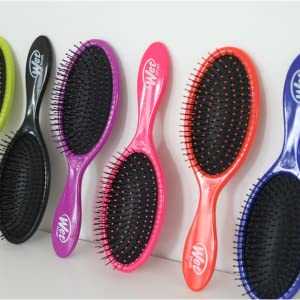 Our famous Original Detangler changed the hairbrush game, and transformed what used to be a painful and time consuming task into an effortless, fun and colorful part of your day. We offer our famous detangling bristles in lots of shapes and sizes – for travel, the shower, kids, styling and more. Brush your wet hair anywhere easily with the Epic Professional Quick Dry Brush from Wet Brush. The Wet Brush set out on a mission to conquer the horrible issue of detangling hair without the tears or damage. They created a unique brush with IntelliFlex bristles that effortlessly run through hair and detangles wet or dry hair without pulling or tugging.